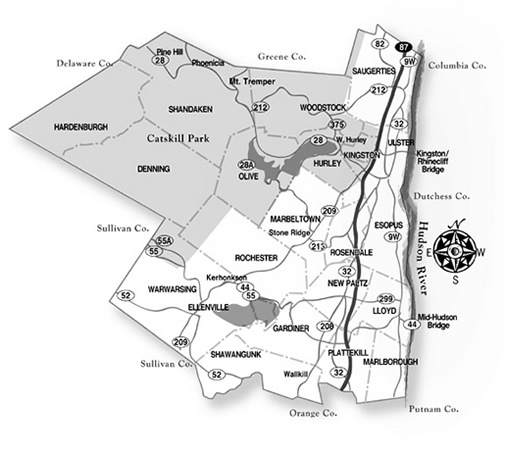 Ulster County New York and Surrounding Communities, Towns, Hamlets, Townships, Denning, Ellenville, Esopus, Gardiner, Hardenburgh, Hurley, Kingston, Lloyd, Marbletown, Marlborough, New Paltz, Olive, Plattekill, Rochester, Rosendale, Saugerties, Shandaken, Shawangunk, Ulster, Wawarsing, Woodstock,Town Offices, Town Clerk, Chambers, Organizations, School Districts, Youth, Recycle, Refuse - Ulster County, Hudson Valley, New York State, NYS - TheCommunityGuide.net published by First Connections, Inc.
Below are the Towns, Hamlets, Villages and Cities that comprise each of the Ulster County Townships, along with their main township office phone numbers and website addresses for quick reference. TOWN Comprised Of: Town of New Paltz, the hamlets of North Ohioville and South Ohioville, the Village of New Paltz, and the home to the State University of New York at New Paltz. Please note that the below map is representational and is only intended to depict the relative position of the various locations within the area representented.